The only official book commemorating Barack Obama's historic Inauguration, Barack Obama: the Official 2009 Inaugural Book (Epicenter Communications, $39.95) lavishly documents the entire inaugural week, from Obama's "Whistle Stop" train ride to Washington to his first days in office. With exclusive access to inaugural events, a team of award-winning photojournalists captured this historic celebration, from the vast crowd on the Mall to the grandeur of the President and First Lady taking their places on the world's stage, to the faces of people of all ages and races watching Obama take his oath of office. And for the first time in any official inaugural book, photographs chosen from tens of thousands of online submissions highlight the diverse perspectives of Americans at this important moment in our history. Commemorating Obama's inauguration in words as well as images, Barack Obama: the Official 2009 Inaugural Book includes a preface by Tom Brokaw: "Barack Obama understood that he was a consipicuous beneficiary of the heroic work of those generational brothers and sisters who marched with Martin Luther King, Jr., in the great nonviolent crusade for equal rights." The foreword by U.S. Representative and civil rights leader John Lewis reminds us of the import of that day: "Barack Obama's inauguration was a day of jubilee... It was as if a great weight had been lifted, and we all became aware that maybe, just maybe, we were beginning to lay down the burden of race in America." In his concluding essay, historian Douglas Brinkley meditates on theglobal stature of the man "who defied odds makers and transcended race to become the 44th president of the United States." The book's timeless and elegant design juxtaposes spectacular photographs with personal written reflections on this unique celebration from a wide array of political leaders, influential thinkers, and cultural icons, such as Nelson Mandela, legendary musician Graham Nash, Mary J. Blige, French President Nicolas Sarkozy. 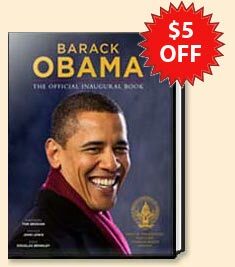 Like the Obama campaign itself, Barack Obama: the Official 2009 Inaugural Book is a commemorative edition unlike any other in history.